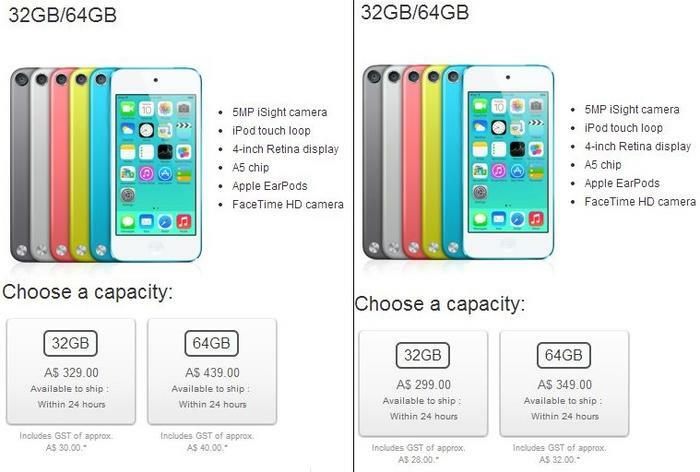 Pricing of Apple’s 32GB and 64GB iPod Touches has been slashed. The 32GB iPod Touch has dropped from $329 to $299, while the 64GB has been reduced from $439 to $349. The introductory 16GB iPod Touch gains new features in spite of retaining its $249 price. It now comes equipped with Apple’s 5 megapixel camera and in five colours. These updates put the introductory iPod Touch in line with Apple’s 32GB and 64GB variants. The iPod Touch is slim at 6mm and has the same display as Apple’s iPhone 5S, that is, a 4in, 1136x640 Retina display. It is powered by Apple’s A5 CPU and the rear camera can record Full HD videos. Apple’s iOS 7 comes pre-installed, but the iPod Touch can be upgraded to iOS 8 when it is released later in the year. Running Apple’s iOS makes the iPod Touch compatible with the plethora of applications available from Apple’s App Store. The updated 16GB iPod Touch will come in pink, yellow, blue, silver and ‘space’ grey within the “coming days”, said Apple.